Cinco de Mayo came a day early for us. J came home from work and said she had a taste for Mexican. I had a coupon from the back of a Harding’s receipt for a Mexican place, so I figured why not. I could use some tacos. 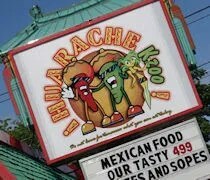 Huarache Kzoo is on Portage Street just after the Lover’s Lane/Portage Street split near Cork Street. The building used to house a Chinese buffet and the exterior hasn’t changed much. 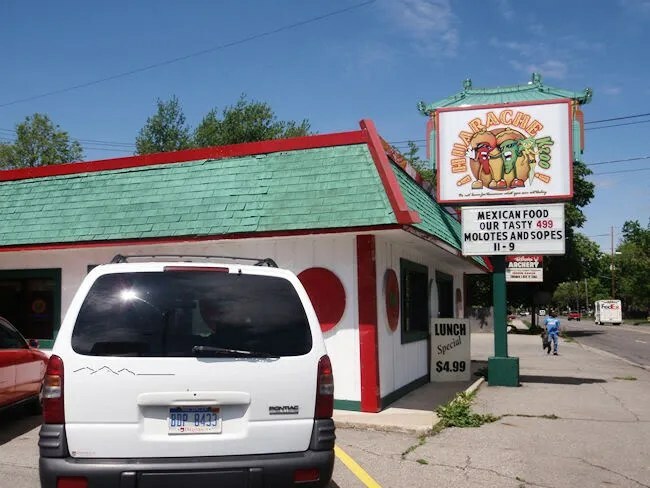 It still has a green pagoda style roof that makes you do a double take when you see the Mexican food sign. The parking lot is a little tight. There are angled spaces along either side of the building and that’s about all there’s room for. Wasn’t a big deal because even though we stopped for lunch, there was only one other car in the parking lot. The inside is decorated with Mexican flags. There is a buffet in the back of the space, but it wasn’t stocked. I don’t know if it’s leftover from the previous business or if they do a buffet at times. I’m sure a buffet would bring us back in. We had one in Lansing near our place that was outstanding! We were met by a guy I assume to be a manager. He was wearing a white shirt and tie and just sort of hovered around the place. He grabbed a couple menus and handed them to the only waitress who showed us to a booth along the north side windows. Our waitress was very soft spoken almost to the point that she felt intimidated or unsure of herself. She picked up a basket of home made chips and salsa then came over to ask about drinks. 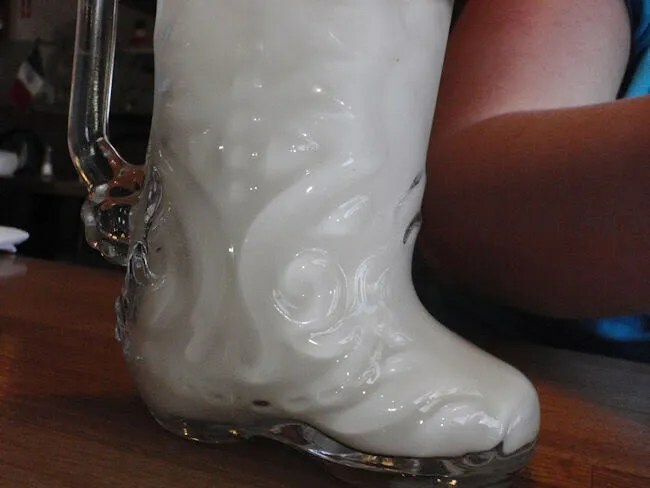 J got a horchata which was served in a glass boot. I stuck with Coke. We snacked on the chips and salsa while looking over the menu. 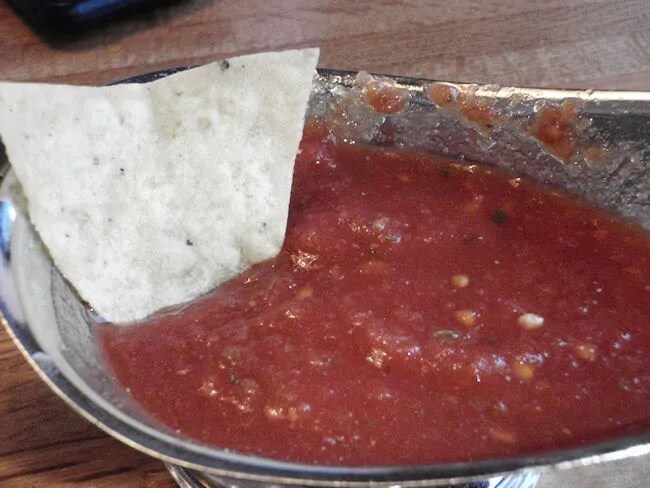 I thought the salsa was delicious. It had just enough kick to it, but J thought it was a little too much. She ended up ordering guacamole to eat with the chips, but wasn’t happy with that option either. The guacamole had a lot of stuff in it and not a lot of avocado. There was a ton of onions, tomatoes and other veggies in addition to a large amount of cilantro which is something she really doesn’t like. It’s ok if it’s there as long as the taste is masked a little. It was not in this guacamole. The menu is pretty large, but it’s not like many Mexican restaurants. All of the choices are written in both English and Spanish and there’s pictures of most of their special items so you know what you’re getting. What the menu is lacking is combo platters. I stuck with tacos. I got two asada tacos and two chorizo tacos. Both with corn tortillas. As long as I have a warm corn tortilla, I’m pretty easy to please. 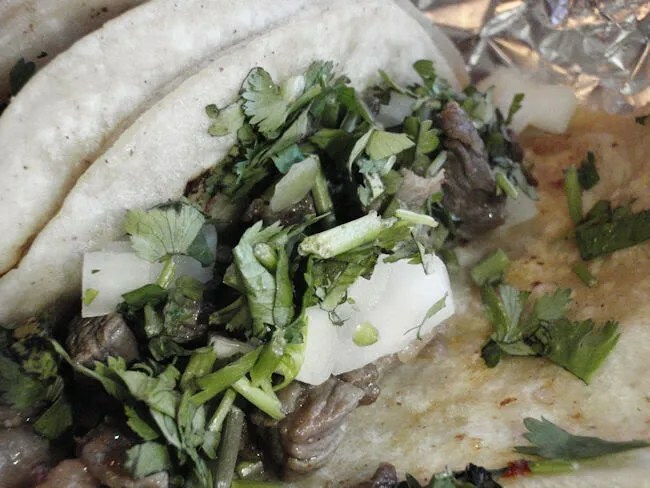 Both tacos had a good portion of meat but they also had onions and cilantro. I don’t mind the cilantro, but I pulled off a lot of the onions. I prefer cheese on my tacos and would have loved some chihuahua or oaxaca but they were still good with out. Both the steak and the sausage had a really good flavor and of course, the corn tortillas could have been eaten all by themselves. 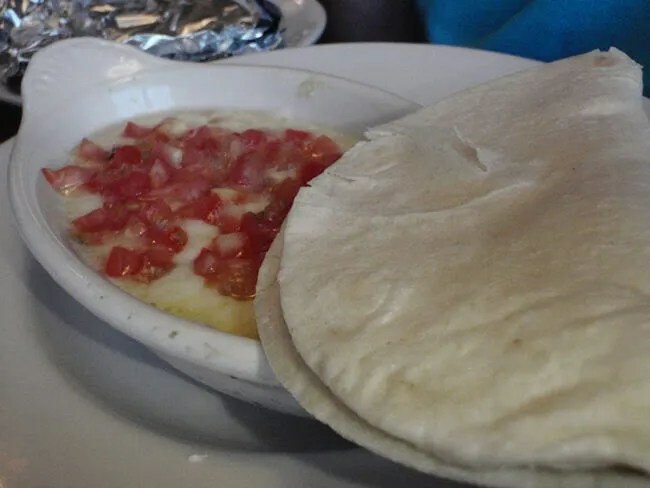 J ordered the queso fundido which the menu described as melted cheese served with two flour tortillas. Neither of us had ever had the dish before so we didn’t know what to expect. J was thinking more of a liquid cheese to dip the tortillas in…hence the “fundido ” part of the name which looks similar to “fondue.” The dish is melted cheese, but it’s a very stringy cheese..almost rubbery. It came with tomatoes on top which J pushed to the side. She actually used a knife to cut pieces of the cheese off and put them between the tortillas like a “make your own quesadilla. I don’t believe she was a fan. After we were done, the waitress brought our check and set it down on the table in one of those little black trays. The bill was $21. I put the 15% off coupon I had and cash on the tray. As we were discussing amongst ourselves whether the waitress would pick it up or if we were supposed to take it to the cash register, the waitress came over and said she’d get it for us. Remember that manager I spoke of earlier? He was also the “cashier.” The waitress took the money over to him, but he was too busy to deal with it. Instead, he was standing in the middle of the dining room talking on his cell phone. Very loudly talking on his cell phone. It’s bad enough when other patrons talk rudely on their phones in a restaurant but this was a manager….possibly an owner, standing right in the middle of the dining, at a table talking on his phone in a very loud voice. If that weren’t bad enough, we couldn’t leave until he decided to at least multi-task and get our change while he was still talking on his phone. It took well over ten minutes and more than one dirty look to get our change. If this review was just on the food alone, I’d say it was alright. I thought it was pretty good. Nothing outstanding, but good. J didn’t like it all. Neither the guac nor the queso fundido did anything for her. We’ll never go back though. A manager talking on his phone instead of taking care of his customers is not something I’ve ever seen before. I had to laugh as I was walking out. It was the only thing I could do at that point. It’s just ridiculous.